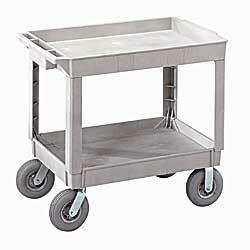 Practically indestructible carts will not peel, chip, crack, or fade. 200-lb. capacity per shelf. Other features include: rounded corners and a front ledge that accommodates a utility basket. Two swivel, 2 rigid casters. SPECIFY COLOR: BE - Beige, GY - Gray. IN STOCK. XC-2103BE 33.8	 Beige	 2	 19-1/4"	 30" x 16"	 32"
XC-2103GY 33.8	 Gray	 2	 19-1/4"	 30" x 16"	 32"
XC-2104BE 45	 Beige	 2	 19-1/4"	 36" x 24"	 32"
XC-2104GY 45	 Gray	 2	 19-1/4"	 36" x 24"	 32"
XC-2108BE 65	 Beige	 2	 19-1/4"	 36" x 24"	 37"
XC-2108GY 65	 Gray	 2	 19-1/4"	 36" x 24"	 37"